The cube comes with a window on each side so you can display 4 photos of your choice. 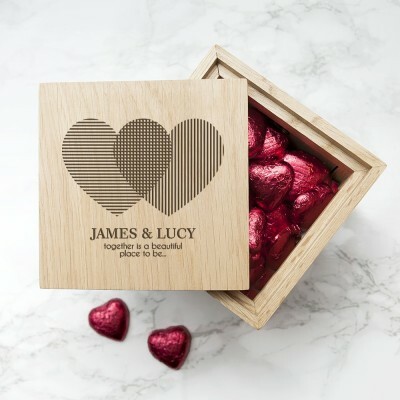 The lid is personalised with couples names and a message, the lid can be lifted off to reveal 30 delicious Belgian chocolate hearts wrapped in a burgundy foil - one heart for every day of the month. Once the month is over, you are able to use the cube as both a photo frame and a keepsake box. The perfect multi functional, romantic gift.